We believe that successful people are busier than ever before, and therefore require that the home buying process be made as easy as humanly possible. Because you don’t make money when you sell a home ... you make money when you BUY it. Every home buyer has different search criteria – that's why we provide six different options on this website to help you start the buying process. 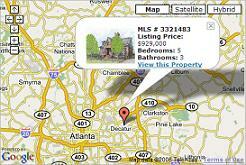 Here you can browse Atlanta area homes according to city, neighborhood, school, zip code, mls number, or map. Our free search tools will give you the edge on other local buyers, and help you enter the market faster. You can also register to see all the details on your favorite listings – registration is free, confidential, and only takes a few seconds. For a quick visual guide to local homes for sale, be sure to visit our map search. Our Google Map allows you to narrow the selections by price range, property type, number of rooms, and neighborhood, to find the listings that are appropriate for your needs. When you're ready to work with a Realtor on your home search, consider the Keen Team. As your buyer's agency we'll make sure you have access to every property for sale in the Atlanta area – even those not listed publicly. Our network of sellers and professional contacts helps us stay informed about listings as soon as they hit the market, and we pass every detail relevant to your home search on to you. When you find a property you like, we provide additional information about the listing, its neighborhood, and nearby plans for development. If the property meets your needs and you decide to make an offer, we make things as easy as possible by representing you during negotiations, attending property inspections, and handling all paperwork related to the sale. It's our goal to help find you the best deal on the property you want, in the shortest time possible. Contact us anytime to get your Atlanta real estate search started. Thank you so much for your efforts on our behalf – your guidance, kindness, and friendship during the process of buying our first home were very much appreciated. We love living here at 516 2nd Avenue! It's great to always have good feelings about you all when we pass RealSource in the Village. Service like we received is hard to find and will not be forgotten.